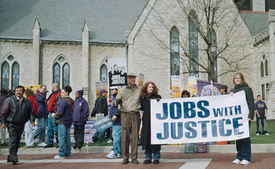 INDIANAPOLIS — On a balmy Midwest afternoon, members of Service Employees International Union Local 3, along with Unite Here workers, community activists and religious leaders, rallied for workers’ rights here March 15. Under the slogan “Rebuilding the American Dream,” union organizers announced that janitors in Indianapolis and the Ohio cities of Cincinnati and Columbus are preparing to enter contract negotiations with the aim of elevating the living standards of nearly 165,000 service workers in those three cities. Janitors in these cities will negotiate with cleaning contractors, such as Corporate Cleaning Services, who provide services to commercial offices, malls, banks, universities, pharmaceutical labs and other facilities throughout the region. According to SEIU organizer Becky Marin, 18 Fortune 500 cleaning companies have their headquarters in the three cities. While those 18 companies have combined annual revenues of more than $364 billion, or $1 billion per day, few janitors earn more than $64 a day. Angela Mendez, a Corporate Cleaning Services employee, is paid just $6.50 an hour without any insurance, sick days, personal days or vacation. Rosario Mendiola is only paid for 2 hours and 24 minutes each night, at the $6.50 hourly rate. She says she must work an additional hour “off the clock” in order to avoid running into trouble with her supervisor.